NOTE: If the EasyCyl attachment has been purchased but the DCS UVEASYCYL printer is not available for install, go to Help > Update License Files, restart the RIP and try again. 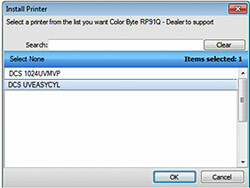 If the printer is still not available please contact Direct Color Systems Technical Support. Choose to Search online serve for printer package(s). The printer package will then install and there will be a new UVEASYCYL queue group and two new EasyCyl queues added to the RIP. The first thing you will notice about the available EasyCyl print modes is that there are not print modes for Color Only and print modes for White with Color. These print modes are designed to print both Color Only or White with Color. What will determine whether a white underbase prints is if the object is primed with white in the Color Byte Design software. If the user does not want a white underbase, do not prime the object in the Color Byte Design software. The two Detail print modes use larger dots. These print modes are good for cylindrical objects that may not be perfectly round. The larger dots will be more forgiving when printing to these objects as there are high and low spots as the bottle rotates. The two Fine Detail print modes use medium dots. These print modes are good for cylindrical objects that are perfectly round. The smaller dot size is less forgiving in terms of distance it can jet from the head which is why it should be printed only to objects that are perfectly round. Using the medium size dots will give a higher quality image than using the large dots. Test different print modes on different cylindrical objects to achieve the best print quality. The Best print modes will print in Uni-Directional and the Fast print modes will print in Bi-Directional which is approximately two times faster than Uni-Directional printing. However, in most cases, printing Uni-Directional will yield higher print quality. 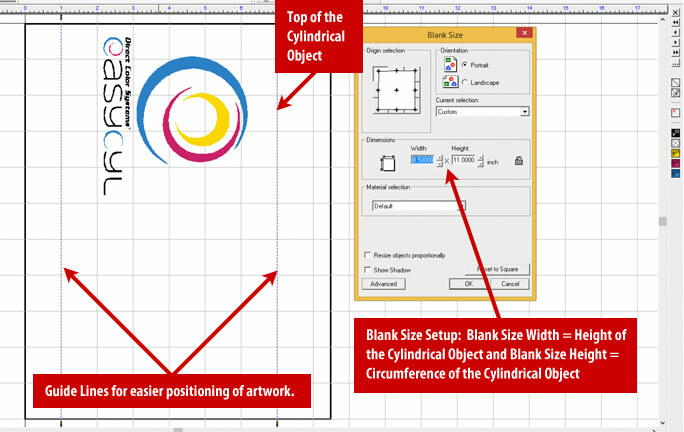 Setting up artwork in Color Byte to print to cylindrical objects is different than setting up artwork for flat object printing. The main difference is that the artwork needs to be rotated 90 degrees to print appropriately on most cylindrical objects. The first step is to set up the Blank Size area. Imagine the blank size area as a wrap that will wrap around the object. The width will be the height of the cylindrical object and the height will be the circumference of the cylindrical object. This particular cylindrical object is 8.5" (215.9mm) tall and has a circumference of 11" (279.4mm) (Circumference = π [3.14] x Diameter of Object) for this object the diameter would be approximately 3.5" (88.9mm). Next step is to determine the area in which the print should be. By right-clicking anywhere in the Sign Blank area, you can add Guide Lines. The Guide Lines have been set to 1" (25.4mm) and 7" (177.8mm) in this file. That will give a 1" (25.4mm) margin at the bottom of the object and a 1.5" (38.1mm) margin at the top of the object. You will not need guidelines if the print is intended to cover the entire area of the cylindrical object. Next is to determine in which direction the artwork should be rotated. This will depend on how the cylindrical object is orientated on the EasyCyl attachment. This particular file is setup so the top of the cylindrical object is at the 8.5" (215.9mm) mark. That way when the cylindrical object is removed from the fixture and is placed on the bottom the EasyCyl logo will be right-side-up.